Global Biostimulants Market size was valued at over USD 2 billion in 2017 and is anticipated to witness over 9.5% CAGR up to 2024. The need to enhance crop productivity owing to rapid soil degradation, is expected to drive the biostimulants industry over the forecast timeframe. Low ecological footprint and non-toxic nature are the key factors driving the biostimulants market share. They are an important component of sustainable agricultural practices. The occurrence of soil contamination and other environmental hazards owing to excessive usage of chemical fertilizers is a crucial issue for the industry. These bio-based alternatives have effectively replaced chemical agro-products at a higher rate on account of their performance efficiency thereby driving the industry growth. Focus on increasing soil fertility along with improving the farm productivity will drive product growth over the forecast timeline. Advantages such as increasing plant tolerance and recovery from abiotic stresses including extreme climatic conditions, droughts, unfavourable salinity, and floods will augment the industry demand. Factors including enhanced crop nutrition and protection will support industry growth. Additionally, biotic stress tolerance against bacteria, fungi, and viruses has enhanced the product adoption rate. Active ingredients are easily available, and the processing cost is low. Thus, the high availability and lower cost to end-user is a motivational factor for its increasing usage. Increasing usage of these products to provide adequate nutrition to the agricultural land will promote sustainable farming, thereby fuelling the global humic acid industry share in the forthcoming years. The product tends to enhance water retention & soil texture properties and promotes microbial activities to make the soil more fertile and productive. The shifting focus of agriculturists on refining soil productivity to alleviate crop loss and enhancing agrarian output will boost the humic acid market demand. The increasing interest of investors owing to significant growth potential has led to multiple product developments in the industry. Factors, such as the integration of cost-effective alternatives and improved accessibility will fuel the biostimulants industry growth. Additionally, biostimulants will dramatically capture the agriculture industry owing to the development of regulatory frameworks for the protection of environment. This will positively foster fair competition and innovation while protecting farmers and consumers. Acid-based ingredients displayed a significant share at over 50% in 2017 owing to the easy availability of raw materials and high efficiency as compared to other ingredients. Vermicompost, humic substances, and organic waste matter are some of the key raw materials used in the manufacturing of acid-based products. Extract based ingredients will observe significant gains at over 10% up to 2024. Rising consumer awareness towards using organic ingredients will fuel the segment growth. Application of seaweed extracts results in higher pathogen and environmental stress resistance in plants thereby increasing the plant cultivation efficiency. It contains the plant growth hormones and trace elements required by plants, thereby supporting its penetration in the biostimulants market. Foliar treatment is expected to account for over 70% industry share by 2024. Growing food demand with the necessity to improve farm yield encourages consumers to opt for bio-based products to boost crop yield. The growing acceptance of enhanced farming techniques and biological microbes are expected to be the key driving factors for the segment. Additionally, the surge in the arable land will further supplement biostimulants market growth. Seed treatment is expected to account for over USD 300 million by 2024. The segment is expected to attain significant growth owing to increase in seed cost, weather change and increased use of multi-component products. Factors such as protection of seed from rotting and resistance to storage insects & pests offer promising growth opportunities for the industry. Row crops are projected to witness the largest and fastest growth over the forecast timeframe. It includes vegetation such as soybeans, barley, corn, millets, cotton and oats that are grown extensively across the globe, thereby offering profitable industry growth opportunities. The use of these products on row crops enhances the yield, seed size, and cell division. Turf & ornamental crops will witness high gains owing to the necessity for enhancing root growth in plants. The segment is mainly driven by factors including increased quality & productivity and the need for improving the soil quality. The product helps in nutrient uptake, increasing the length of roots & absorption of water, and strong & healthy appearance of crops. Therefore, their use on turf & ornamental crop will witness a healthy growth over the forecast period. Dry form accounted for the largest share in 2017. This growth can be attributed to various benefits, such as improved cell division, plant respiration, and photosynthesis. It improves the lateral bud development and delays aging of plant tissues. Ease of nutrient absorption as compared to liquid form are key factors influencing product demand. Liquid form is expected to observe the fastest growth over the forecast period. It offers better shelf life compared to dry form, which results in better nutritional elements availability for the plant. Additionally, it aids plants, turf, and crops to quickly recover from stress and encourages better root growth and facilitates higher absorption. 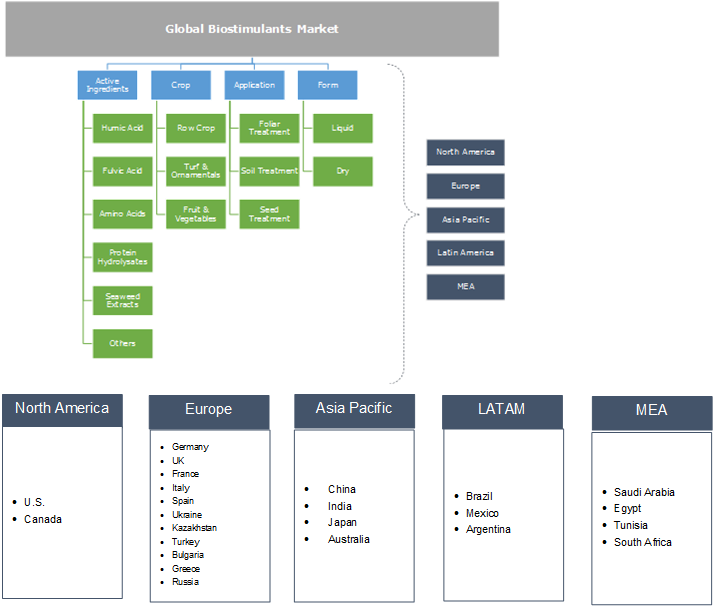 Europe accounted for over 30% of the overall biostimulants market demand in 2017. This can be attributed to the higher demand for agronomic products and changing consumer habits for organic products. With rising involvement & direction from government authorities and mounting demand for sustainable agriculture, it is expected that the product will continue to experience substantial growth in Europe. Supportive policies from the regional authorities to improve organic food production is anticipated to increase the usage of bio-based products. Asia Pacific is anticipated to surpass 150 kilotons demand by 2024. Countries including China, India, and Australia have highly diverse income levels, food consumption habits, & spending capacities and extensively contribute towards industry growth. The regional agricultural sector is projected to witness steady growth and the population is largely dependent on the farming sector which offers promising opportunities for business growth. In addition, the rising necessity to increase farm fertility to meet growing food demand will facilitate regional growth. 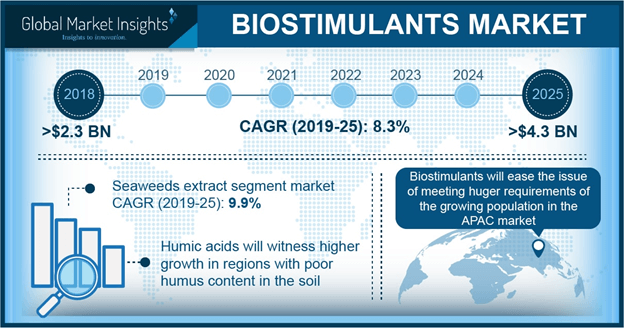 The biostimulants market is highly fragmented due to the presence of several regional and global players. The key players include Valagro, BASF SE, Koppert B.V., Bayer, Biovert SL, Tradecorp Nutri Performance, and Tradecorp Nutri Performance. Other notable players include Arysta Lifescience Corporation, Artal Agronutients, Lallemand, Ag Concepts, Daymsa, ILSA S.p.A., and Biochim S.p.A., Mahafeed Specialty Fertilizers Pvt. Ltd., Micromix Plant Health Limited. Companies are investing heavily on R&D to expand the product portfolio, leading to an increase in product adoption rate. Acquisitions and partnerships with raw material manufacturers and other companies to increase the company’s reach and expand product portfolio are supplementing the industry expansion. For instance, In May 2018, Arysta Lifescience Corporation acquired Etec Crop Solutions to enhance their product development capabilities and expand in specialties segment. A biostimulant is a microorganism or substance that helps to enhance crop productivity. It consists of naturally occurring degradable materials that do not affect the plant. As a result, it is witnessing a high demand in organic farming practices. It does not cure the nutrient deficiency, instead, it enhances the nutrient uptake, metabolism, water retention capacity, and chlorophyll yield. It enhances the antioxidant activity of the plant, thereby reducing environment-induced stress and the occurrence of diseases. It also stimulates root development, growth, and cell enlargement, thus aiding robustness and general health of the crop. Initially, its use was confined to organic farming and high-value fruit & vegetable production. However, now its scope is expanding in traditional agricultural practices as an integrated crop management approach.